The second weekend in our picnic adventure took Rami, Barclay and me to far east Austin. We stumbled upon the Montopolis Youth Sports Complex when we were looking for Roy G. Guerrero Colorado River Park on Saturday night. After a jaunt east on Airport Boulevard from I-35 and a winding drive through the Montopolis neighborhood, Rami and I found ourselves at 400 Grove Boulevard, the address registered with Google Maps for Guerrero Park.There is a parking lot and some trailheads that lead into Guerrero Park at that address, but the more obvious landmark there is this lovely sports area. Montopolis Youth Sports Complex has a few baseball fields with concession stands and bleachers, a batting cage and a small playground. 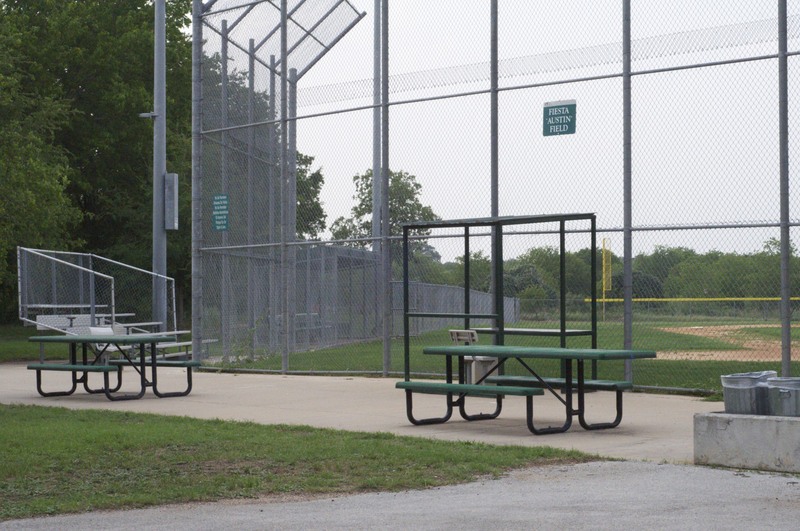 We counted six picnic tables at the park, situated near trash cans at the edges of each playing field. 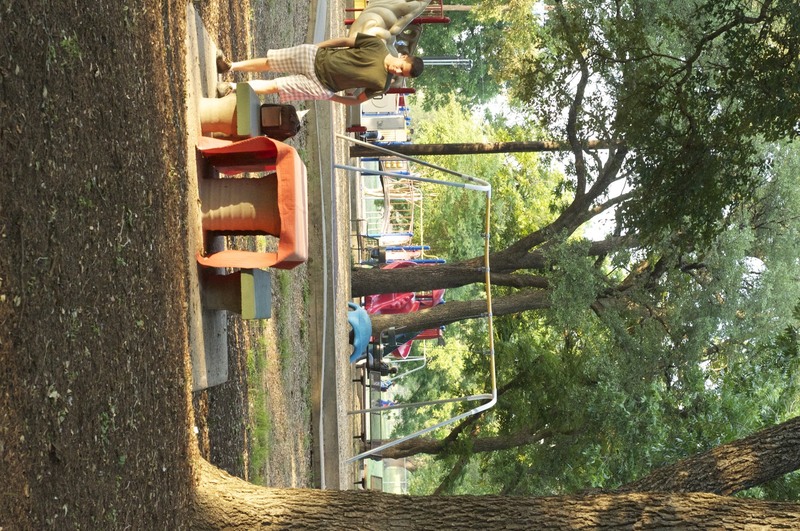 There are lots of tall trees at the park, and most of the recreation areas around the baseball fields are in full or partial shade. It’s obvious from the manicured lawns and clean trails that the Montopolis Sports Complex is well cared for, and it’s probably very busy during baseball, softball and tee-ball seasons. However, Rami and Barclay and I were the only souls there at dinner time on Saturday night. The solitude at the park was great! We enjoyed our whole meal uninterrupted and Barclay was able to run around on his long lead and explore the park. These salads were a really easy picnic menu since I was able to make most of them ahead of time during the week. I don’t know what I was thinking packing pickled beets on a picnic. They taste awesome, but the magenta beet juice threatened to stain our orange picnic blanket with every bite! Rami did a smart thing and packed a few paper napkins so that we could wipe down our dirty plates before we packed up to head home. 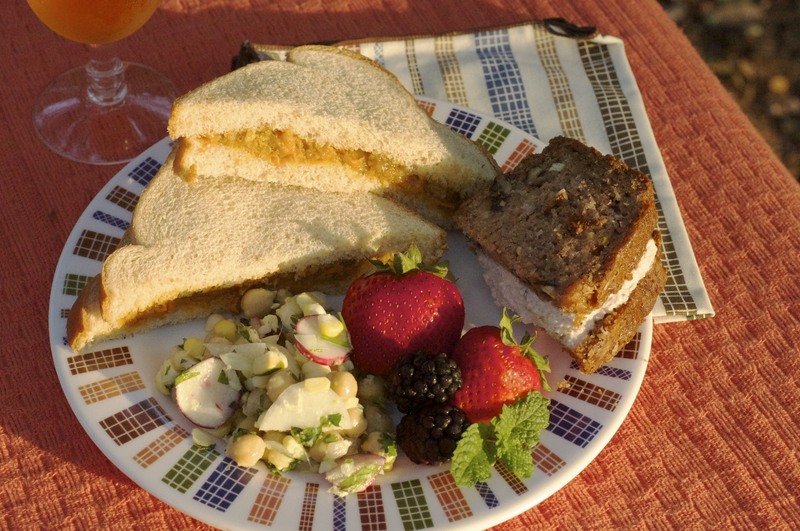 The wax beans and green beans from Acadian and Tecolote Farms were the standout ingredients in this week’s picnic. I used these fresh treasures in place of canned green beans in my favorite four bean salad recipe. Preparation: trim ends off of green and yellow beans, then snap beans into bite-sized pieces.Bring a scant inch of salted water to a boil in a large saute pan. Add fresh beans, cover and cook for about five minutes, until beans are tender. Drain the beans and set aside to cool. Meanwhile, open and drain canned beans. Chop the bell peppers and onion into small pieces. In a small bowl, whisk together oils, vinegars, sugar, salt and pepper. Put all the beans, onion and pepper into a large salad bowl and pour dressing over the top. 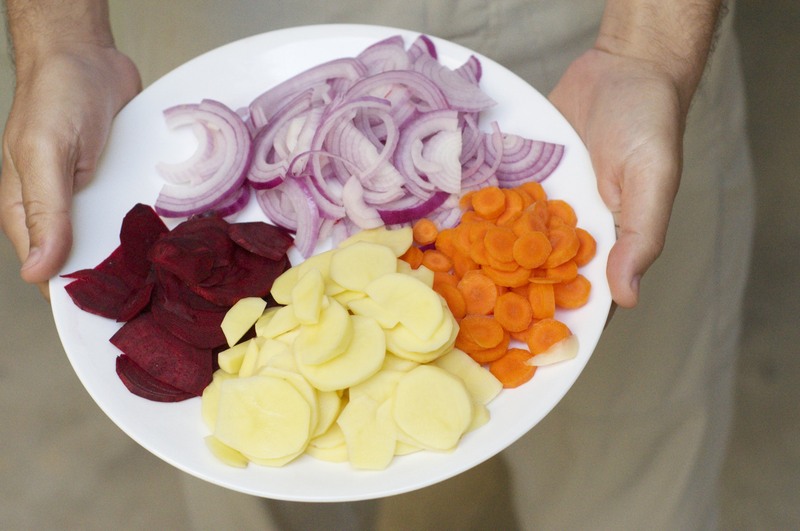 Cover and refrigerate overnight before serving. 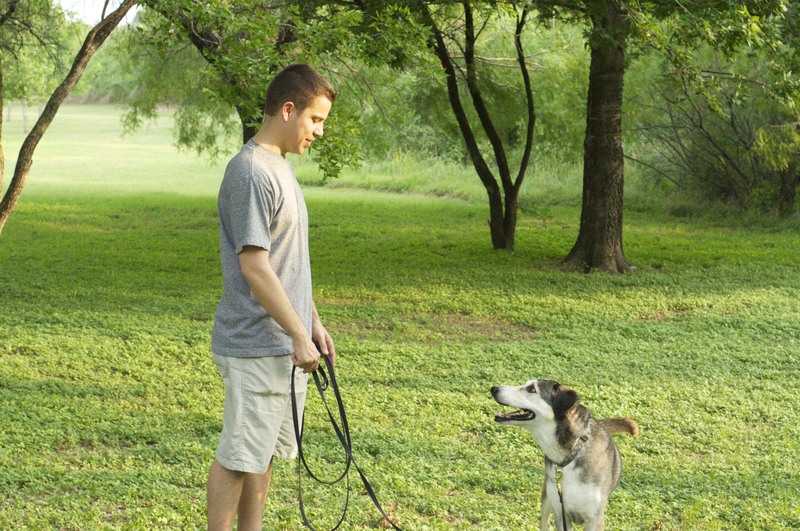 Two of the best things about living in Austin are the weather and the outdoors. 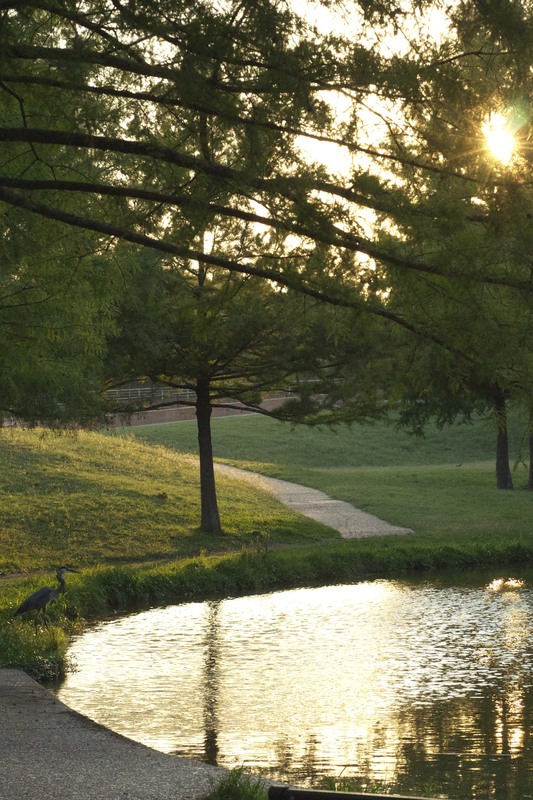 In 2009, Forbes named Austin one of the “best outdoor cities” in the nation. Yet, after almost a decade living here, I have explored just a few of Austin’s public outdoor spaces. This summer I’m working to fix that. 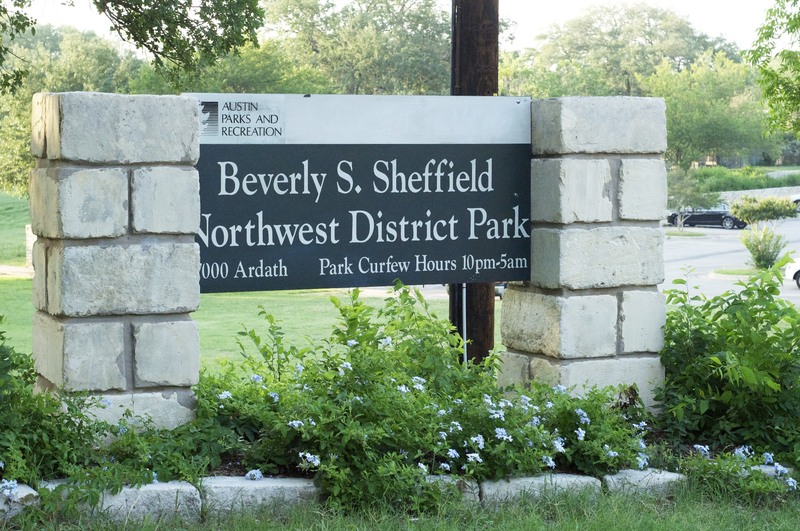 My husband Rami and I have resolved to take weekly picnics around Austin so that we can visit lots of different parks in the city and enjoy some great food together. We are well outfitted for our picnic adventure: we’ve had a nice insulated picnic basket for years, courtesy of my mother in-law, and we threw down $7 at Goodwill last week so we’d have a proper picnic blanket. We’re hoping these picnics will be a fun, cheap way to spend time together over the summer, and a chance to experiment with new recipes. I rarely cook lunch for us, so cooking sandwiches and picnic dishes with seasonal, local produce will be a nice way to stretch my cooking chops. 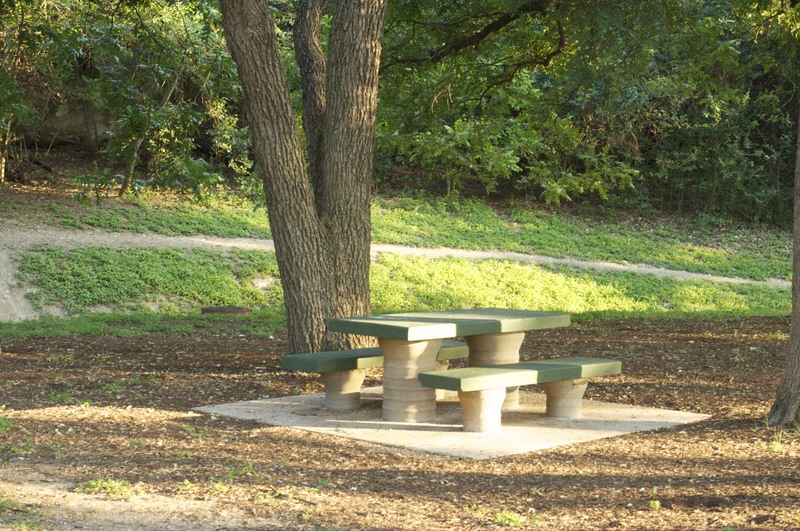 We started our picnic tour on Sunday at Walnut Creek Park in north central Austin. 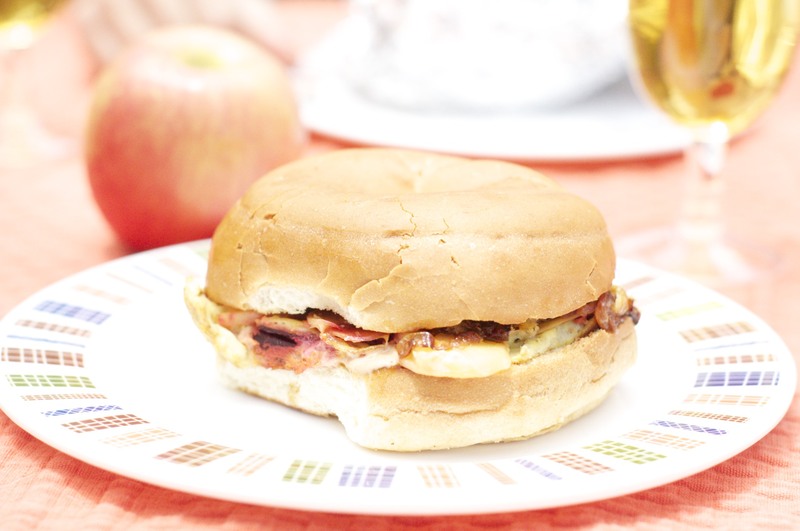 On the menu were sliced apples drizzled with local honey, a bagel sandwich with a root vegetable omelet, and a bottle of Texas wine. The meal took us about 45 minutes to make. 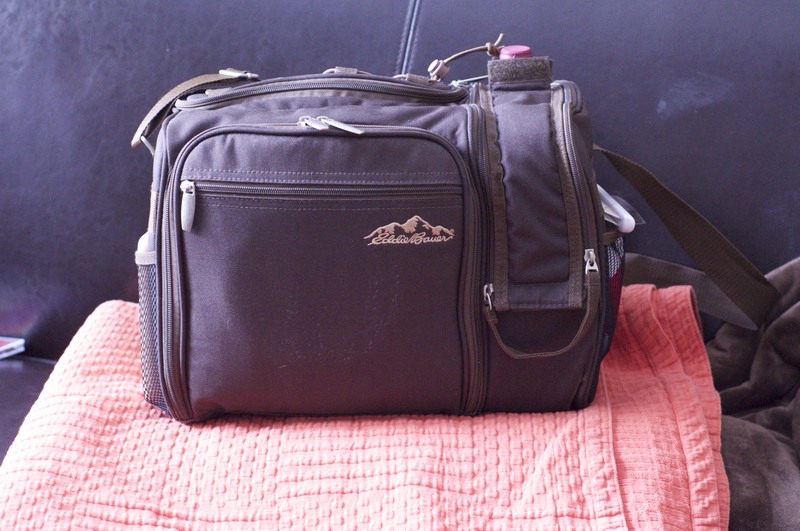 I packed two whole apples in the picnic basket along with a paring knife and the bottle of honey. For the sandwiches, I used Scott Ehrlich’s recipe for Spanish-Style Beet, Carrot and Egg Sandwich published by Food and Wine. Rami and I made the sandwiches with carrots from Acadian Family Farm, beets from Massey Farm, spring onions from Bar W Ranch and Farm and Yukon potatoes from Green Gate Farm. 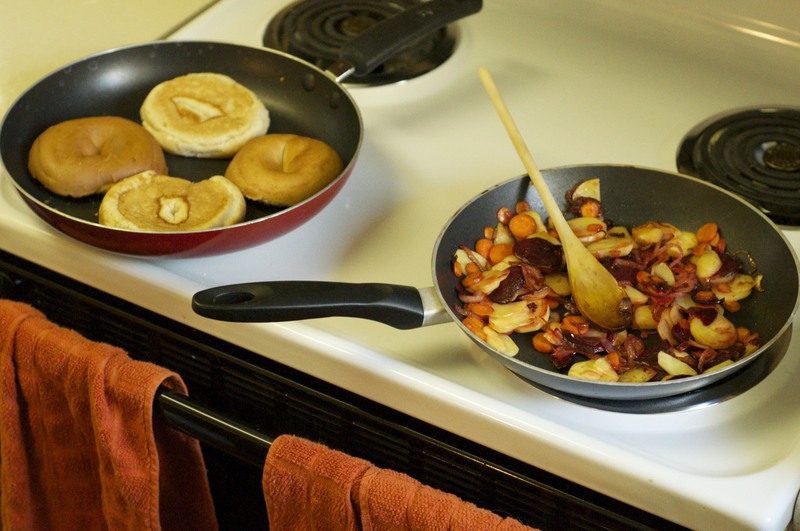 The sandwiches were easy to cook, and the omelet portion of recipe will probably join our regular brunch rotation, especially when we get beets in our local box. (I never seem to use those up!) For the picnic I assembled the sandwiches at home and wrapped them individually in foil for transport. Our insulated picnic basket kept the sandwiches hot until we arrived at Walnut Creek Metropolitan Park, which is just 10 minutes from our house. 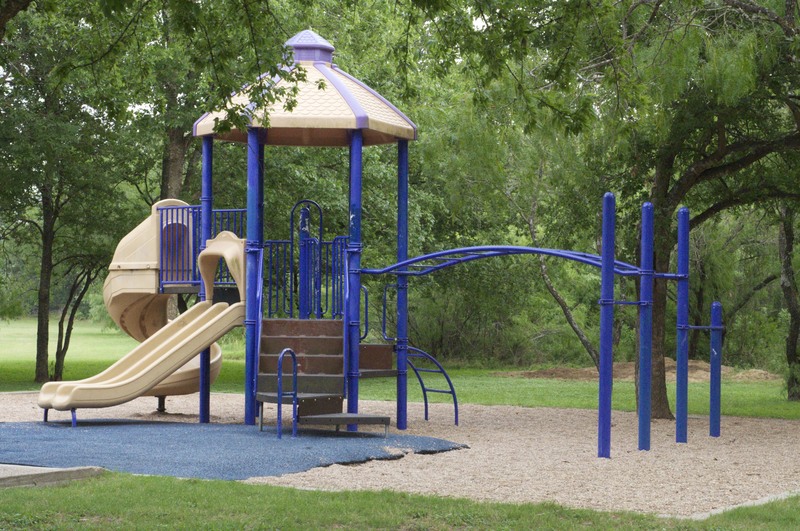 Walnut Creek Park has extensive hiking and bike trails, an off-leash area for dogs, plus a baseball diamond and a playground. There are 26 picnic tables at the park and Rami and I had no trouble finding a quiet, clean place to eat around noon on Sunday. Our picnic table overlooked a shady clearing near a trailhead to the north, and a playground to the south. There’s also plenty of free parking available on the park property. 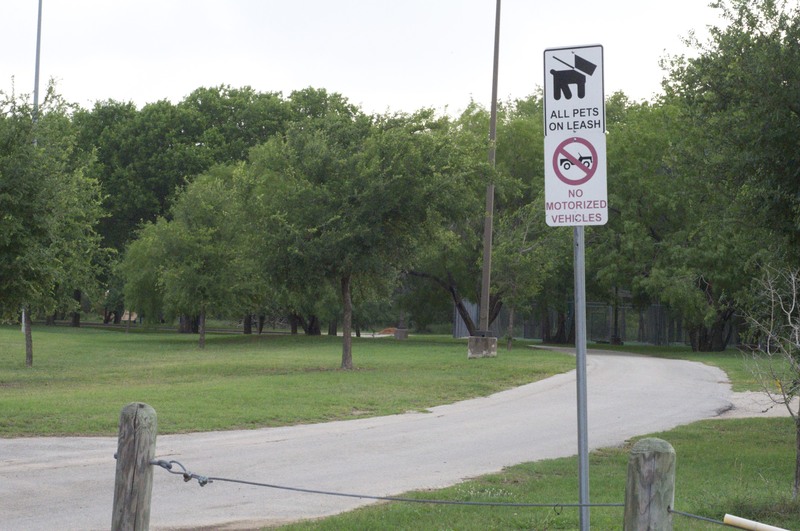 You can’t tell it from this picture, but this part of the park is very popular for dog owners since it’s near the off-leash area of the trail. Our dog Barclay was on his leash at the picnic table, and he enjoyed greeting several other dogs who walked by during our meal. All in all we considered this first picnic venture a success. The sandwich was good, the wine was sweet, and the park was a pretty relaxing place to spend our Sunday afternoon. I’m sharing this recipe in support of Austin Bakes for Japan, happening Saturday, April 2nd!! Please join us at one of the five bake sale locations in Austin on Saturday starting at 10 AM. If you’re not in Austin, you can follow our progress that day via Twitter or our online giving page. So remember when my mom and I threw a book-themed baby shower for my sister Beth? One of the things we had to make for Beth were butter bars with coffee frosting. This cookie recipe is her very favorite. It is a pretty straightforward icebox cookie, named for the butter in the dough, and the shape of the bar of the dough before the raw cookies are sliced. This recipe is one of my favorite family heirlooms, and I love it more than any china or jewelry I’ve inherited. My Grandma Hakes (mom’s mom) gets credit for the recipe, and for three generations, women in my family have been making butter bars. Make that four generations! Beth had her baby in January, and Ella was in tow in the Snugli when we were making these cookies on Saturday. 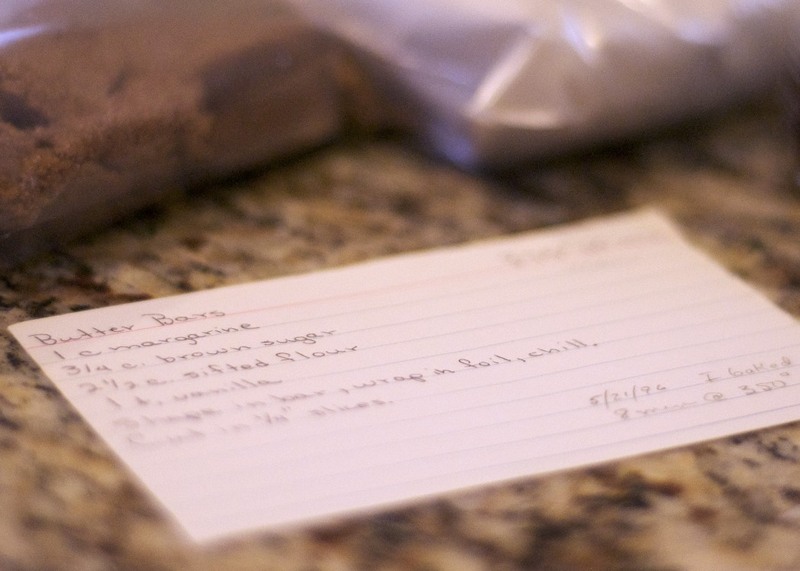 The notes on the bottom right of the recipe are in my Grandmother Hakes’ hand. She was on hand for the cookie making at Christmas 1996. I don’t remember the specifics of that visit very well, but I always smile when I see Grandma’s notes on my mother’s recipe cards. I’m not sure whether Grandma iced her butter bars when she first started making them. 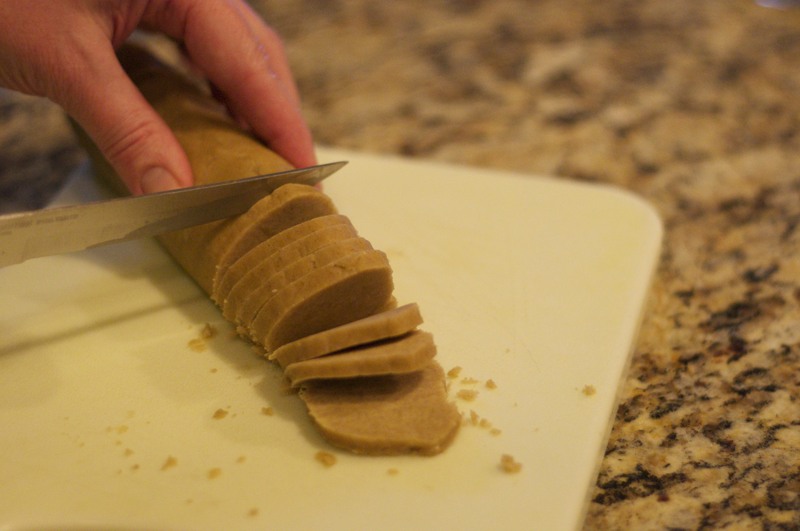 My mom developed this coffee frosting recipe, and our family has perfected it over many years of practice and testing. I’ve given Mom’s frosting an Austin twist by using Austin-brewed Chameleon Cold-Brew coffee in place of the instant that she uses. I think the cold brewed coffee has a stronger, sweeter flavor than regular coffee that pairs perfectly with the toasty crunch of the cookie. In fact, the first time I tasted Chameleon Coffee at TECHMunch, I knew I had to use it in this recipe. Disclosure: the bottle of coffee that I used for this batch of cookies was a gift from Chameleon Coffee to all TECHmunch participants, so I didn’t buy it with my own money. Thanks, Chameleon Coffee! I’ll be joining hundreds of other bloggers, bakers and local businesses this Saturday for Austin Bakes for Japan, a city-wide bake sale benefitting AmeriCares work in Japan. 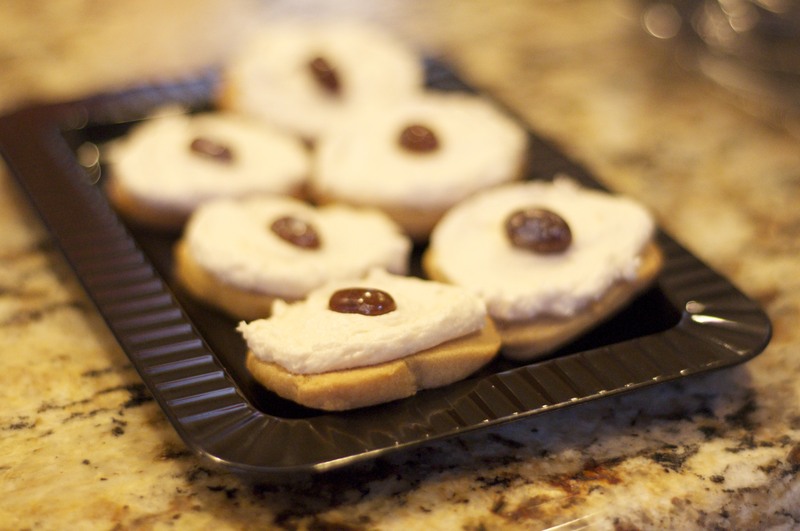 We have five locations in town, and there will be 24 packages of butter bar cookies at the East and Central locations. I’m keeping my fingers crossed that each package of cookie will pull in $5 or so, and my contribution to Saturday’s $10,000 goal will be over $100! Don’t the cookies look pretty on the plate? Items at the bake sale have to be wrapped and ready to sell, so we packaged six cookies each on rectangular appetizer plates that Mom found at Party City. 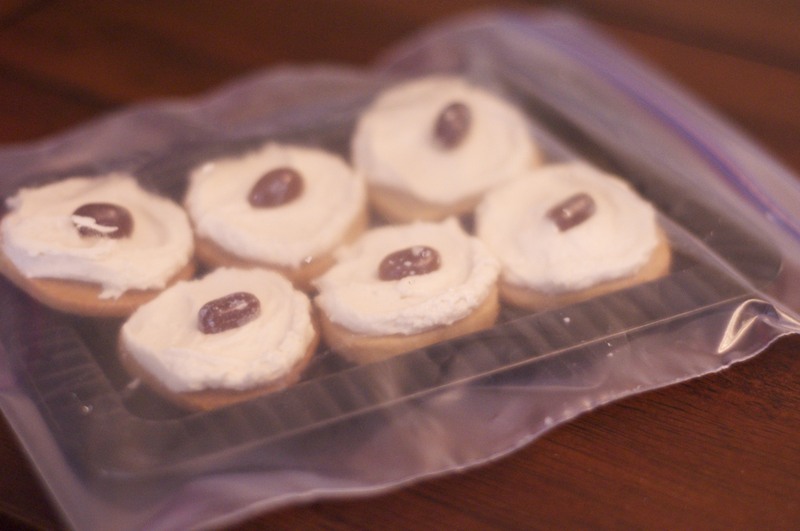 The plates of cookies fit perfectly into Ziploc freezer sandwich-sized bags (about an inch longer than regular sandwich bags). Here’s what the cookies will look like on the tables Saturday. Cream butter, brown sugar and vanilla using a stand mixer fitted with the paddle attachment. Add flour and keep mixing until it is completely incorporated into the dough. It will be thick and very crumbly. 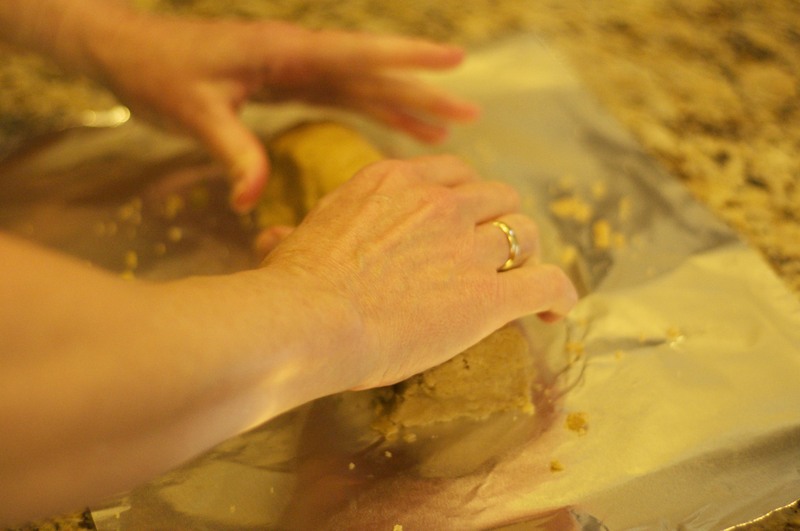 Divide the dough and shape each half into a log 1-3/4 inches in diameter. 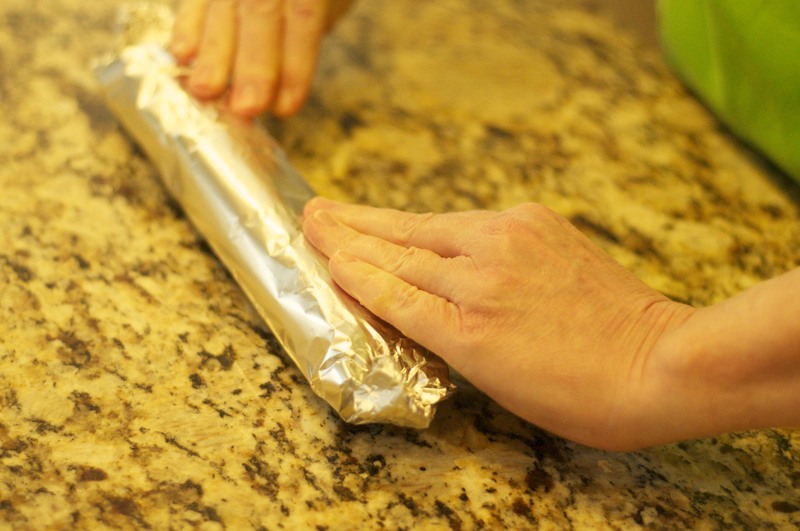 Wrap each bar in foil and chill for at least an hour. Preheat oven to 350. 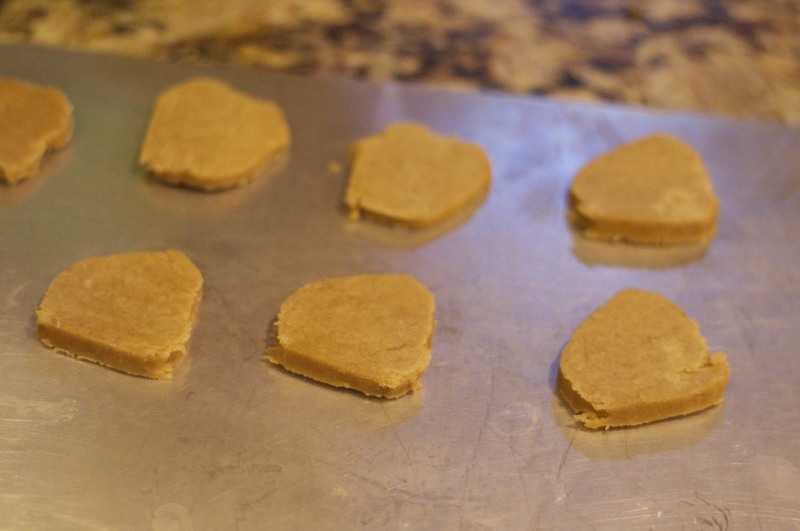 Cut dough into 1/4 inch slices and bake in preheated oven for 8-10 minutes, until cookies are golden brown. 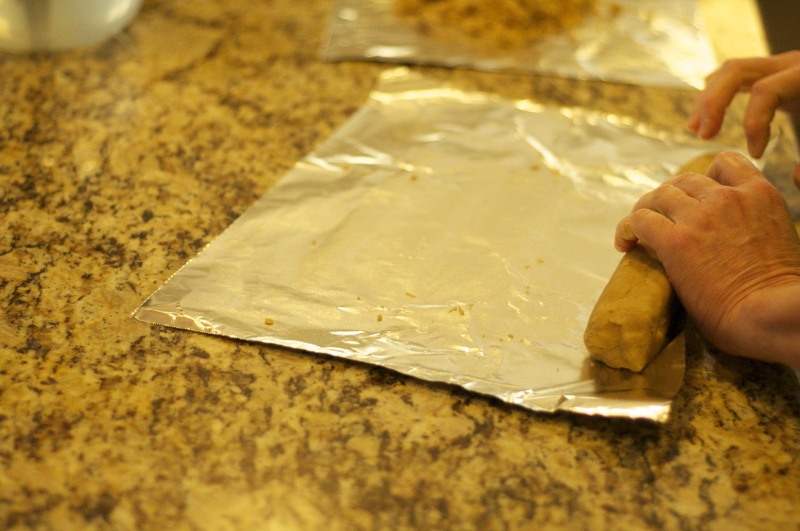 Allow cookies to cool for 2 minutes on the baking sheet before moving to a wire rack to cool completely. Cream butter, shortening, coffee and vanilla using a stand mixer fitted with the paddle attachment. 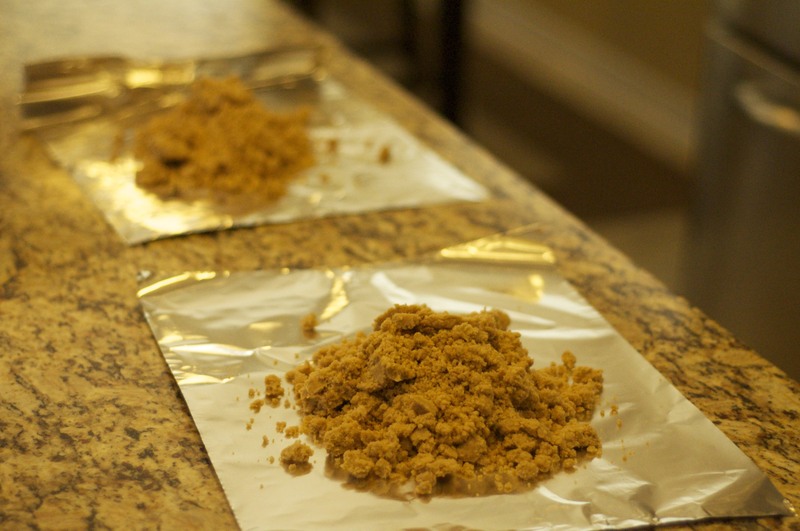 Add powdered sugar 1 cup at a time until frosting reaches a spreadable consistency. Spread frosting on completely cooled cookies. 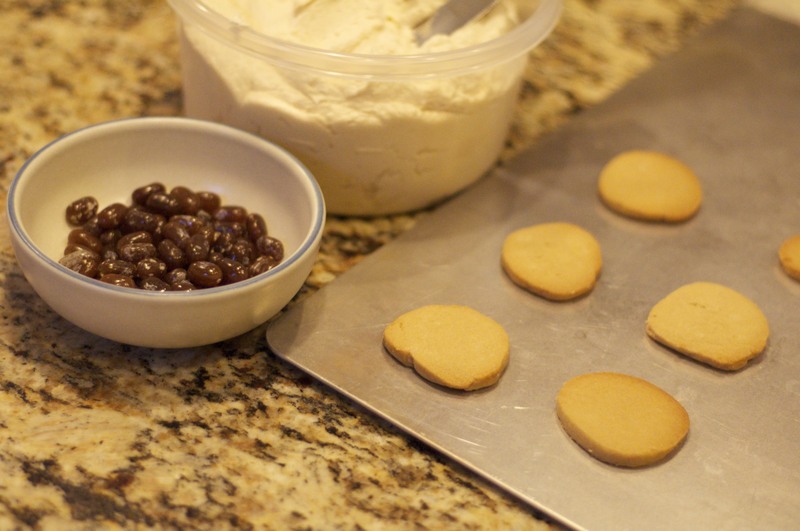 Top each cookie with a chocolate covered espresso bean, a few cocoa nibs, or (my mom’s favorite) a coffee flavored jelly bean. Thanks to my mom and dad who bought the ingredients for these cookies, my mom and sister who made all the cookies and packaged them for the bake sale. Mom and Dad also gave $50 to AmeriCares through the bake sale’s online giving page. My sister Beth is going to be helping with the sale on Saturday. Rah, rah, rah Hutchisons, Decks, El-Farrahs! Tonight, Rami and I enjoyed one of the best meals we’ve had at home in quite a while. 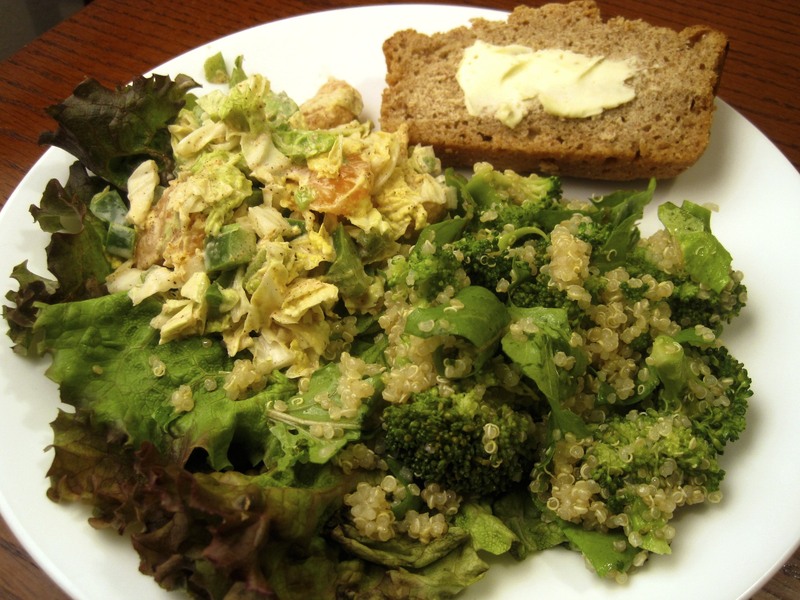 We ate a gingery citrus cole slaw and a quinoa broccoli salad, plus whole wheat beer bread. And the best part, I didn’t cook a single thing! That’s a dangerous question in our house, because in a matter of minutes, he had been put in charge of making our entire dinner. 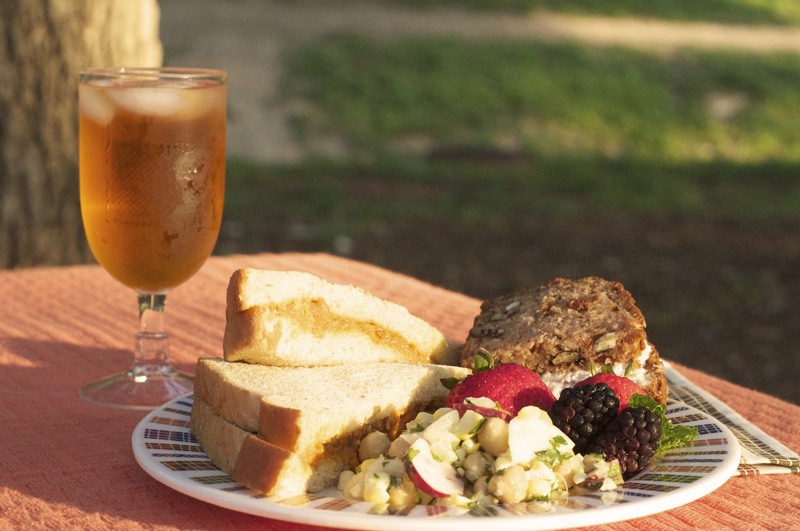 He prepared two salads, Kathy Patalsky’s Napa Cabbage Cole Slaw and Amy Sherman’s Quinoa Arugula Salad, plus a loaf of whole wheat beer bread as a test for another food swap recipe. 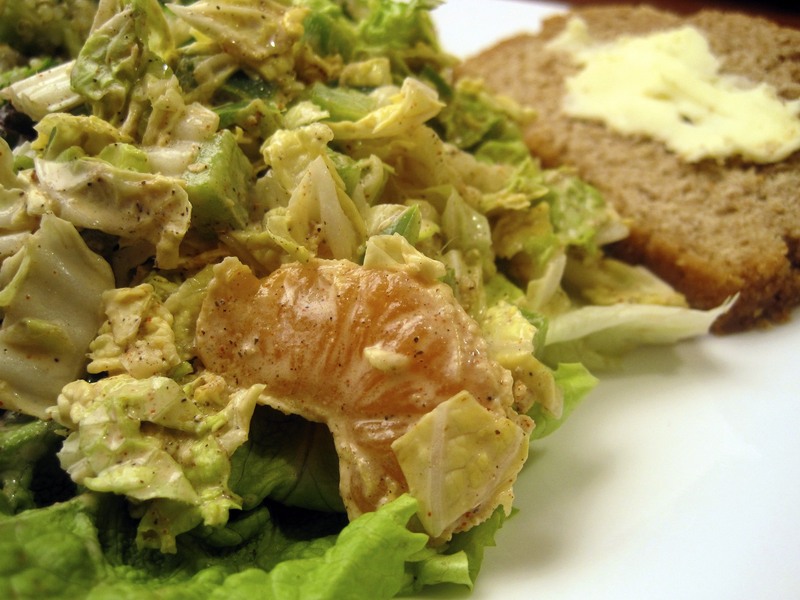 The cabbage slaw is one of the best cabbage recipes I’ve found online. Rami is typically not a fan of cabbage, and I don’t care for tangerines. However, in this recipe, we loved both of those foods! Rami did make a few substitutions in Amy’s recipe according to what we had on hand: tangerines from G&S Grove instead of oranges, double the amount of regular mayo instead of vegan (sorry, Amy!! ), and a green bell pepper instead of yellow. Next time we make this, we’ll experiment by using less ginger and even more tangerines. And the flavor of the dressing is so strong, I think I might be able to get away with adding a whole bag of sunflower sprouts to the mix. Rami was pretty liberal in his interpretation of the original recipe, which originally called for shaved asparugus, avocado, and lemons. He used broccoli from Texas Daily Harvest (he added it to the quinoa pot for the last 5 minutes of cooking time), subbed tangerine juice for the lemon juice, and skipped the avocado. 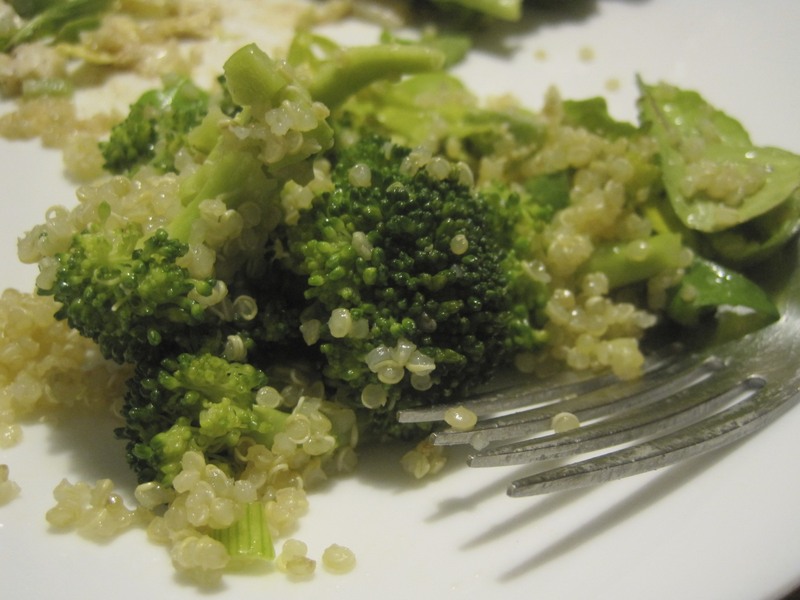 The textures of steamed broccoli and quinoa really work well together, so next week I’ll be looking for more recipes that call for them together. 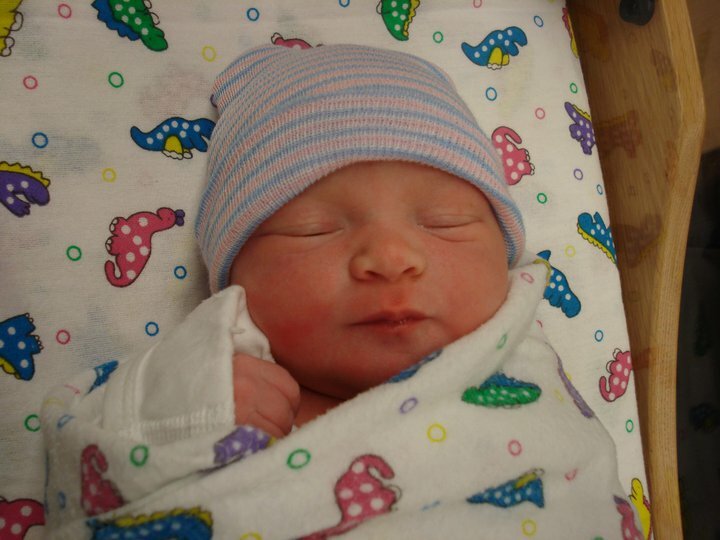 Thanks to Ella’s arrival, we ended up eating out for dinner on Thursday, Friday, Saturday, and Sunday nights with family. I’m not complaining– we finally got to show off Blue Star Cafeteria to my parents– but I do have a lot of leftover produce in my fridge today. Four meals’ worth, to be exact! Plus, I feel a little bloated. 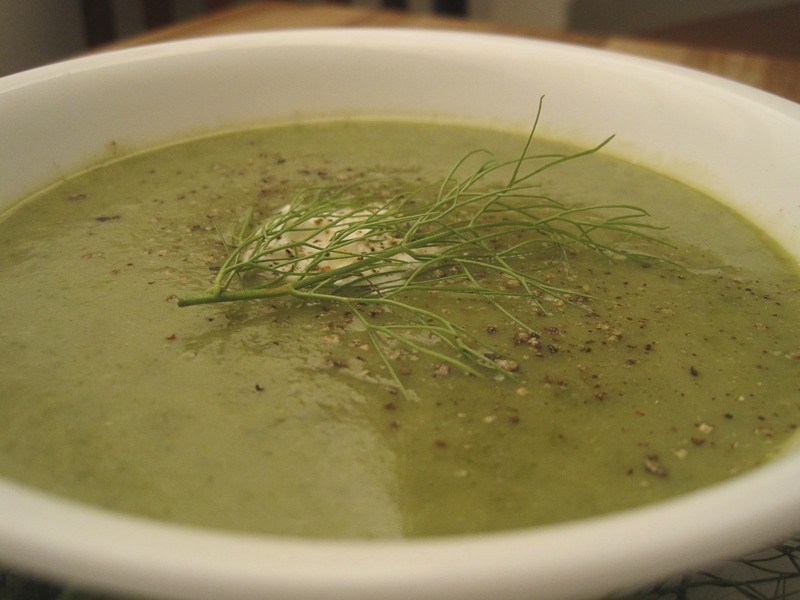 In order to knock out a lot of veggies and help my poor stomach, I turned to this Potato-Fennel soup recipe from the Mayo Clinic Foundation for Medical Education and Research. I knew the potatoes would give the soup a mild flavor, and fennel is supposed to be great for digestion. I adapted the Mayo Clinic’s recipe by incorporating turnip greens and radish tops into the soup, and by increasing the liquid in the recipe accordingly. And since I had just one half-pound bulb of fennel on hand, that’s all we used. (I couldn’t taste it a bit in the final dish.) I happened to have radish tops and turnip greens in my fridge today, but any cruciferous dark green would work well here. However, I would avoid would be mustard greens; their spiciness would probably overpower the delicate balance of flavors in this soup. All weekend I’ve been imagining what kinds of food Ella will enjoy as she gets older. Hopefully some day I can make her a big steamy bowl of this fennel soup and tell her all about the weekend that we met! Chop the onion and fennel bulb*. Heat olive oil in a large soup pot over medium heat. Add chopped onion and fennel. Saute until the onion is translucent and the fennel begins to soften, about 5 minutes. Meanwhile, peel and chop potatoes and wash and chop greens. Add potatoes and greens to the pot, along with the broth and milk. Bring the soup to a boil. Reduce heat, cover, and simmer until the potatoes are very tender, about 20 minutes. Using an immersion blender, puree the soup until smooth. Taste and season accordingly. Ladle into bowls, garnish with fennel fronds, sour cream, and additional pepper. 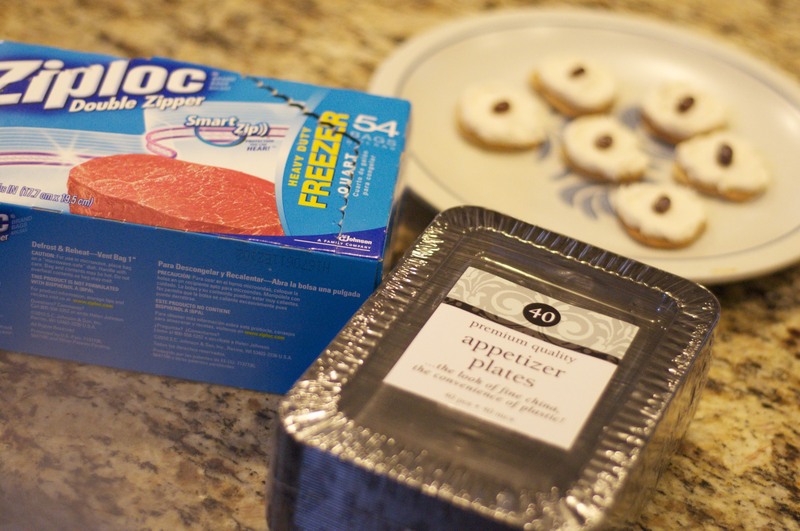 This post is sponsored by Greenling Organic Delivery and a modified version appears on their blog, Eating Out of the Local Box. 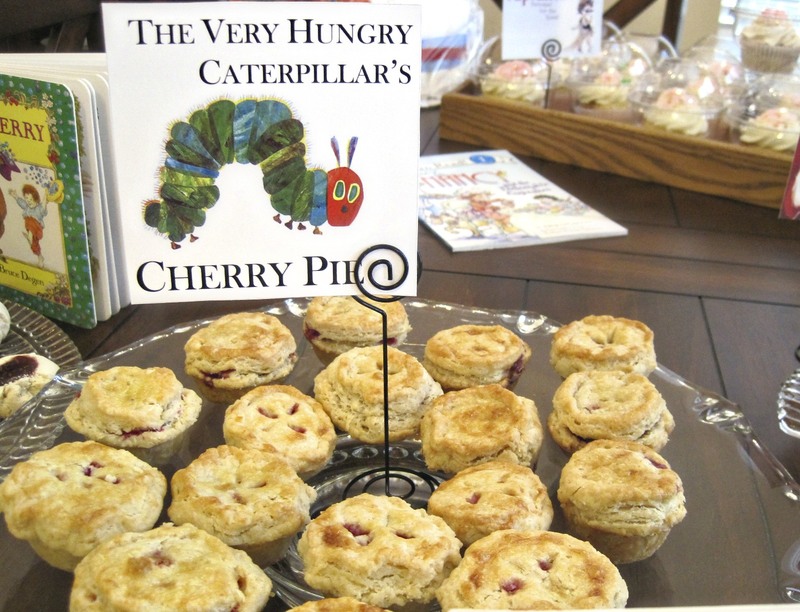 What it is about mini cherry pies that makes them so much tastier than the regular sized ones? Perhaps they are easier to eat. Or the tiny crust-to-cherry filling ratio is better. Maybe it’s the cute factor. For whatever reason, these mini pies were one of the most popular dishes at my sister’s book-themed baby shower last month. I made them using my standby pie crust recipe (seen here and here) and a jar of wild cherry preserves homemade by my aunt in Carlisle, Iowa. After rolling the pie crust to 1/4 inch thickness, I used a 2-5/8 inch biscuit cutter to cut the top and bottom crusts. Then I placed a bottom crust into each well of a mini-muffin tin, using my fingers to press the crust flat down into the tin. I put a 1/2 teaspoon of cherry preserves in each pie and brushed the edges of the bottom crusts with egg wash. I placed the top crusts on the filled pies, pinching the crust edges together with my fingers. Finally, I used the tip of a paring knife to cut four vent holes in the top of each finished pie before giving them a final brush with egg wash. I baked the pies for 35 minutes at 350, until the crust was golden brown. A full recipe of double crust and 1 cup of cherry jam yielded 32 tiny pies. This assembly method was effective, but next time I’d like to experiment to get a prettier finished product. Although the pies stayed sealed, I wasn’t happy with the fluting effect I got with my bare fingers and the muffin tin, plus the tops of the pies were lumpier than I wanted. None of the guests at the baby shower complained about the fluting, so I’m not sweating the cosmetics here too much. Still, I’m eager for the next time I have occasion to make these so that can figure out a better way to attach the top crust. Any advice, fellow pastry-obsessives?